Some people (grinchy, scrooge-y people) think that Christmas is just for kids. We think those people need a hot toddy and some Ella Fitzgerald Christmas tunes on vinyl, but maybe we’re purists. Put on your ugliest holiday sweater, stoke the fire, and get ready folks, you’re about to have a classic Christmas, Salt Lake City style—cool enough for grown-ups. Do things that glisten not bring you joy? Do not the sparkling lights in the night sky make your face beam like a child’s? Lighten up! 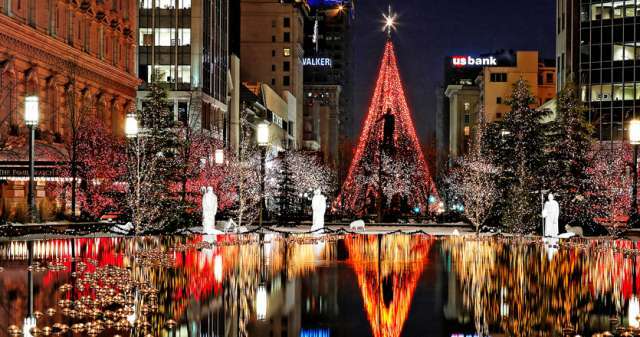 Downtown Salt Lake City’s preeminent Christmas light location is and ever will be Temple Square. Regardless of your religious belief (or lack thereof), one can’t help but stammer in awe of the sheer number of lights displayed each year. You can usually pop into the Tabernacle or Joseph Smith Memorial Building to catch some beautiful music, and if the masses are too much for you, the downtown location is just blocks away from some of SLC’s finest food and beverage. Salt Lake City’s Downtown Alliance, the Gateway, and City Creek are running the Jingle Bus, a simultaneous downtown shuttle between major shopping points, and a holiday-themed ride to catch all of the best downtown holiday decor. It runs from 5-10pm, 7 days a week, free of charge through December 28. Because we’re so fond of the Gibson Lounge, and stepping back in time a bit, we are in full support of playing a little game of vintage Christmas when you go to look at the beautiful Grand America Windows. Don your dandiest hat and coat, visit the Gibson for a martini, then go admire the exquisite handiwork in the Grand America windows. If you’re up for a drive, hit up the South Jordan Candy Windows. Crank the heat in your Subaru, pick up an overly-sweet coffee, and blast Mariah Carey’s “All I Want for Christmas is You,” ten times, because Christmas should be a time where you shouldn’t be ashamed of your guilty pleasures. We get it. Sometimes the saccharine sweetness of holiday music can push you over the edge. Especially if you’ve been hearing the Muzak version of it since mid-October. These more refined versions are just what the doctor ordered. If you have never heard the Utah Chamber Artists perform, now is the time for a remedy. This performance, Welcome all Wonders, is a Christmas performance, but without your traditional Christmas music—a five-movement choral symphony...not exactly “Rudolph the Red-Nosed Reindeer.” If you’re looking for holiday spirit but need some elegance, this is your jam. That said, sometimes, you just want to scream your head off to Jingle Bells, and we see absolutely no harm in that. 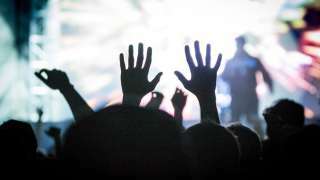 This almost doesn’t pass muster in the “grown-up Christmas” category, but sometimes, you just want to sing with Christmas Carols with thousands of other weirdos, Christmas Carol Sing-a-long, you’re our hold-out on cool. The Salt Lake Men’s Choir’s holiday concert is something we look forward to all year. What the Season Means to Me will be a range of holiday standards from some of the most beautiful voices in the valley. They’ll be collecting non-perishable food items at the door as part of a food drive, because they’re wonderful like that. Now, if you’ve been persuaded to take in some of the more traditional takes on the holiday, it’s kind of hard to ignore hearing the Utah Symphony play them. Their annual performance, Here Comes Santa Claus, again avoids the cloying, over-the-top, sweetness that can make holiday tunes too much to take, and turns them into works of art. For the past five years, The Lower Lights have put on a Christmas Concert in the Masonic temple. They’ve outgrown the venue, and are now performing at Kingsbury Hall. This group of some of Utah’s finest homegrown musicians puts on quite the show, and can get even the grumpiest among you to tap your toe to their versions of holiday classics. Never to miss out on holiday cheer, the Utah Film Center is screening a newer classic, Dr. Who: Last Christmas at the Salt Lake City Public Library, on December 8. The Whovian among you will no doubt combine cosplay and Christmas in some unholy alliance to be unveiled where tinsel drapes your fez cap, or you use lights instead of a scarf. And this one... this one might be perfect. Home Alone with the Utah Symphony. You watch the classic film, the Utah Symphony plays the John Williams score, live. Come. On. Learn to pair the best bubbly with your meal at Holiday Libations at The Leonardo. You’ll find out which sparkling wine will be best for your special occasions. Throughout December, enjoy special free performances as part of Winter Nights at Natural History Museum of Utah in addition to your regular admission. So after you check out the dinosaurs, grab a coffee and catch some holiday cheer while you’re at it (what we’re saying is, there’s no escaping it. You should just embrace it).